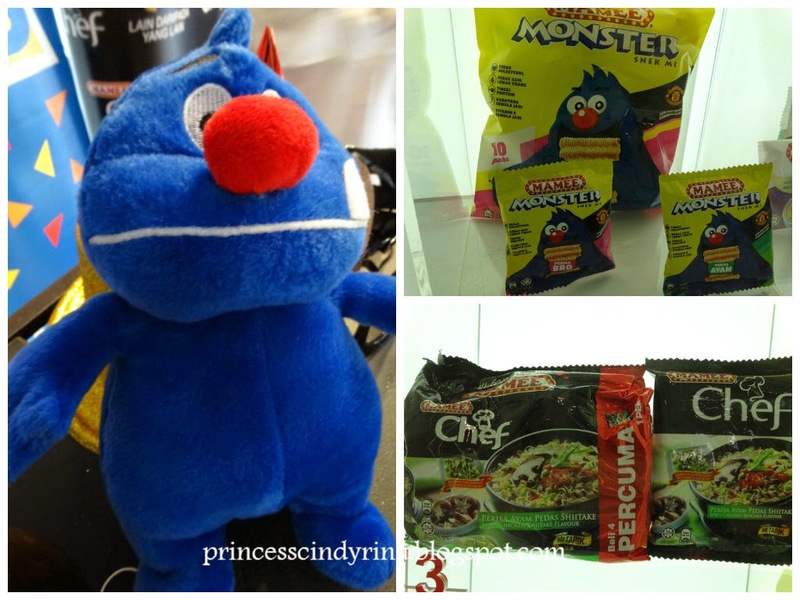 I never missed to bring along my favourite Mamee Monster Barbeque flavour and Mamee Cup Noodles Curry and Tom Yam flavour every time ,I travel abroad. Reason, we are Malaysian taste bud so after few days abroad we still miss the local flavour, right??? Then the Mamee Snack always saves me from ‘Hunger Pang’ while enjoying my sightseeing. I received an invitation from Nuffnang to visit Mamee Chef Factory at Ayer Keroh,Malacca on 31 May 2014.I confirmed my attendance immediately! I visited Malacca like every Quarter once and pass by that factory like many many times. Can anybody just stop by and walk in to have a sneak in to Mamee Factory? Hohohohohoh….try your chance!!! I guarantee you won’t pass that gate easily. If you were me…will you pass on this opportunity? Guess what? 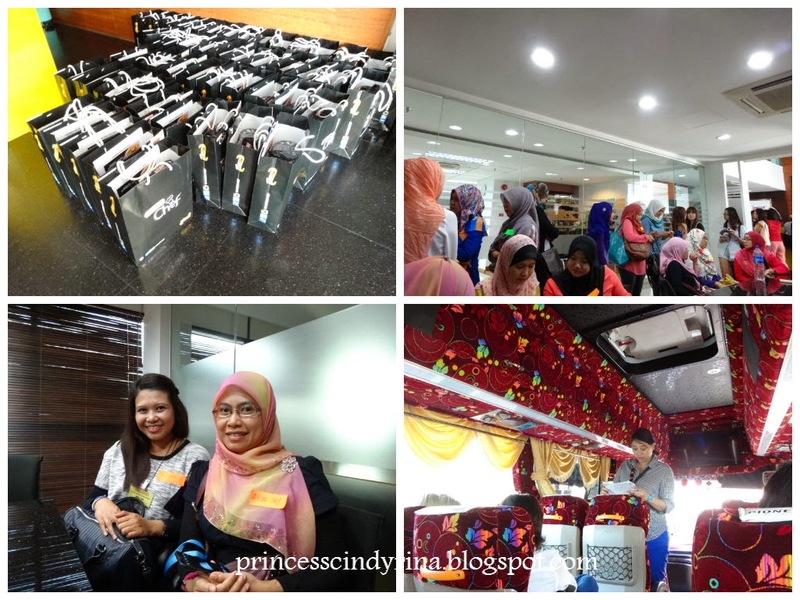 I am among 80 bloggers selected by Nuffnang to visit Mamee Chef Factory! IMA so damn happy! - meet up point at Mamee Double Decker (M) Berhad, Lot 793, Persiaran Subang Indah,Off Persiaran Subang 47500 Subang Jaya,Selangor. Let me walk through my experience during this exciting visit…serious!!! After all this while been longing for a school field trip…and I received this opportunity…IMA so excited until can’t sleep the night before.Butterflies in my stomach, nervous due to my public phobia! WTH! As usual since IMA so excited until cannot sleep…so end up reached Mamee Subang Office as early as 7:15am. Serious…nobody reached there yet! I don’t know anybody here…but manage to make some friends.If you see the lady in blue pant..her name is Rona and she is our team leader.Yeeehaaahh! I am in pink team and bus no. 2. There are 2 buses leaving from Mamee Subang office. In the real fact….instead of leaving from Subang Office 8:00am sharp as mentioned…we end up leaving at 9:00am.Reason? Many hasn’t arrive on time due to unable to find the way to meet up point. IMA! Survey the place one week ahead ,duh!!!! Since it is a school holiday, we caught in really bad jam…serious!!! Terrible jam all the way! 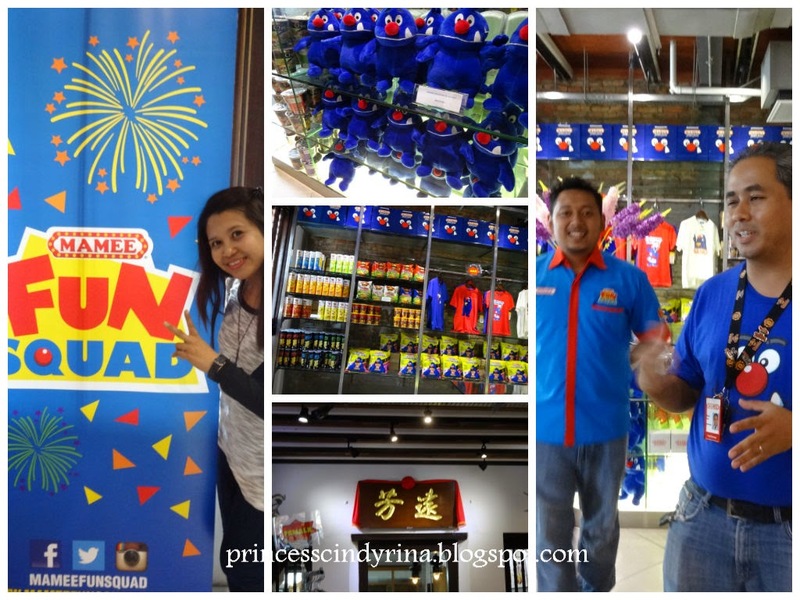 Anyway, we finally reached Mamee Double Decker , factory around 11:30am and we were welcome by Mamee,Marketing Manager,Ms Soong Sham Mee and Mamee Fun Squad team. Before we proceed to Mamee Factory plant visit, we have a group photo session and many blogggers don’t miss chance to take selfie around the area.Apparently, all is competing for most creative selfie for #Mameechefday to win Hamper from Mamee Chef. After the group photo session, we were ushered to another area for introduction speech about Mamee history, achievement and the famous product Mamee Chef. 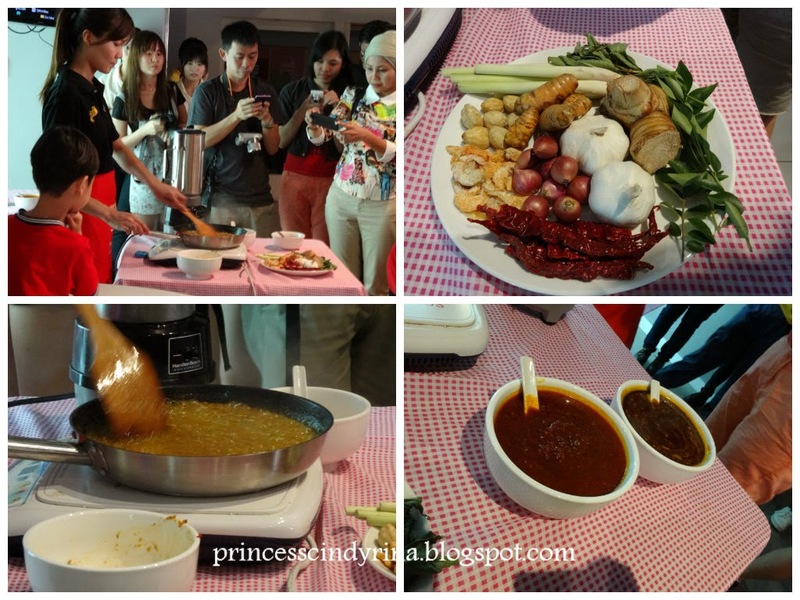 Then we were presented with La Mian show and that ‘Heong’ Curry Laksa gravy created by Chef Ismail for Mamee. Mamee was founded in Malacca in the year of 1971 as a partnership between father (Current, Mr Chairman-Yg Berbhg Datuk Pang Chin Hin) and son, Yg Berbhg Datuk Wira Pang Tee Chew. Their first product was Instant Rice Vercemilli under brand name ‘Lucky’. Subsequently , launched a product under the brand name Mamee which is from the word, ‘Mommy’ since this is the first word most of us learned to say. What a great brand name creation…who can forget this name? This has been registered to our mind ever since we learnt how to talk. Mamee,instant noodle did moderately well. One day, Yg Berbhg Datuk Pang Chin Hin who was out making deliveries noticed some kids eating raw instant noodles right out of the packet. What he saw that day really change the future of Mamee. He created a noodle snack just for the kids. Mamee offers about 50 food and beverage products, which includes snacks,instant noodles,dairy products,beverages and confectionery. It exports variety products which include yougurt,fruit juices,cultured milk,instant noodles, snacks and other beverages. Mamee has a presence in more than 80 countries where most of the markets are concentrated in the region of Asia, Africa, Americas,Europe,Oceania and Middle Easts. At current Mamee hold 30% in our domestic market share. 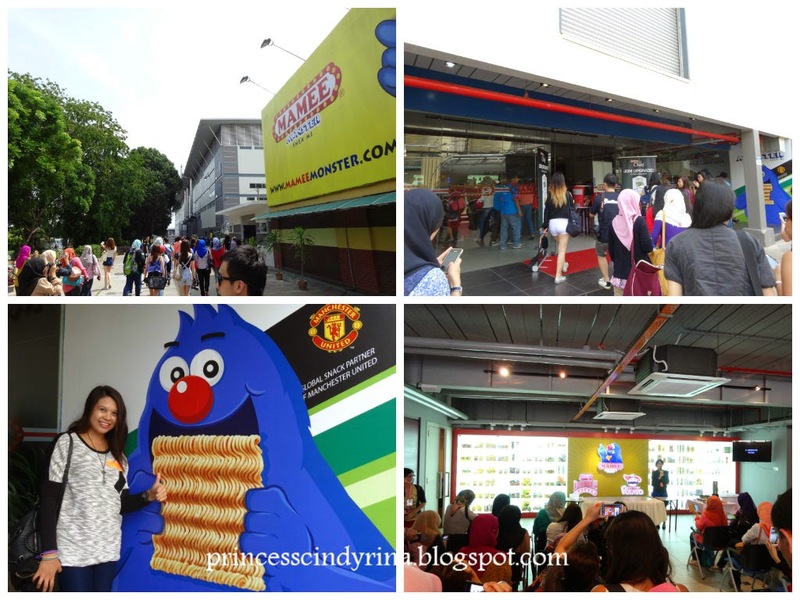 Among the Company’s products are named such as Mamee Monster,Mamee Instant,Mamee Classic and Slurp!Noodles,Mister Potato Chips,Cheers Beverage,Nutrigen Cultured Milk Drink and latest Mamee Chef. 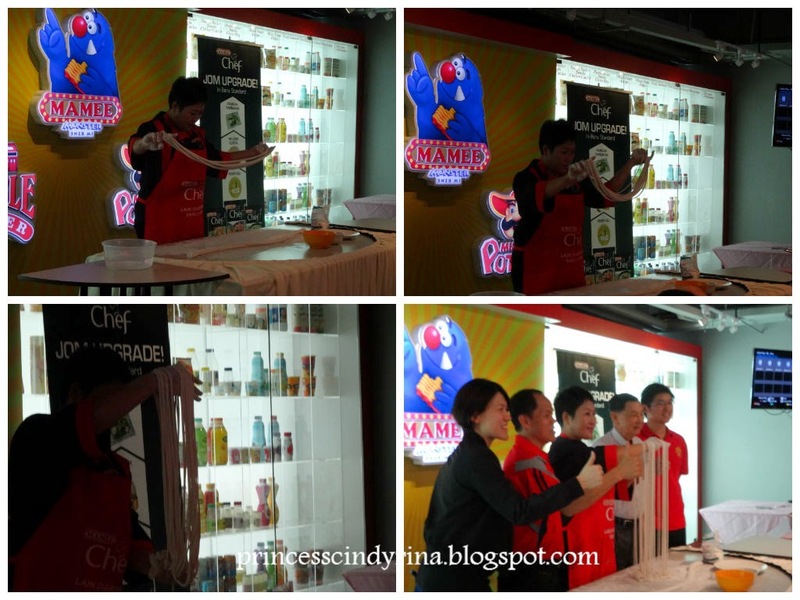 · Mamee Chef placed among the top 10 best instant noodles in the world 2014 by Theramenrater.com. Mamee is going through the 3rd generation pass on and I guess that is way this inspiring innovations was created.Mamee Chef was a very differentiated products. 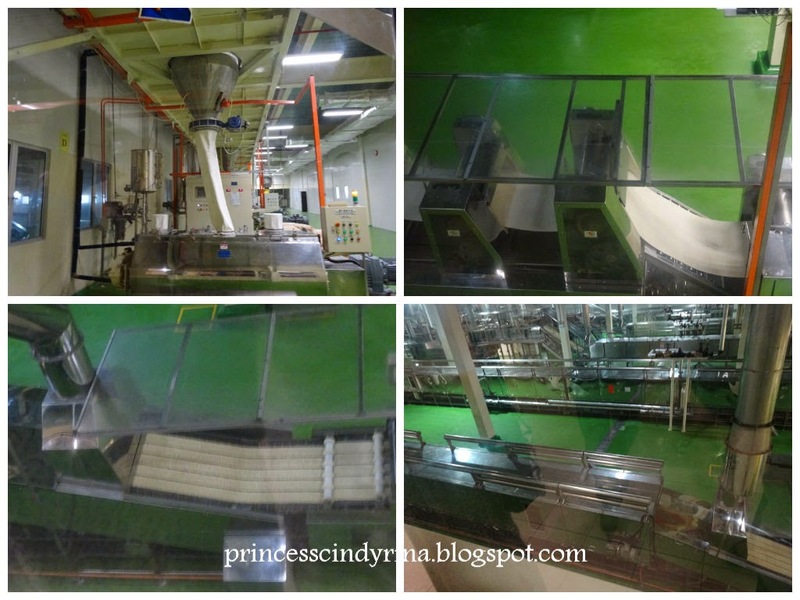 Mamee invested RM80million on new machine which able to create better texture and a premium quality feel to its noodle. Mamee Chef with its “Mi Tarik” or La Mian technology presented to consumer noodles with more springy , tender and quality feel. 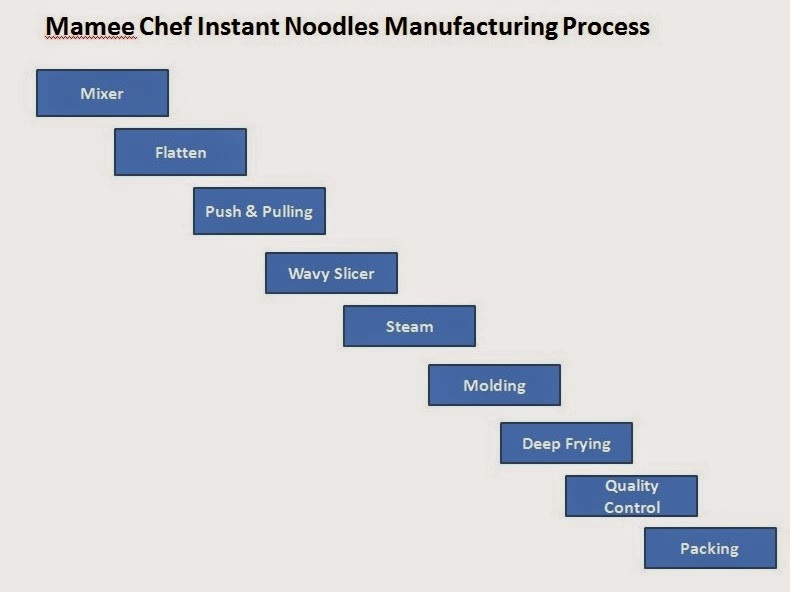 This machine use the same La Mian technique which is pulling and folding process.The best thing about Mamee Chef is they gone through every details making consumer feel that this wasn’t just a normal instant noodles but make one feel like they are eating a proper meal. Why I said that? Each Mamee Chef contained dehydrated condiments such as prawns,cabbage,spring onion,tofu,chilli flakes,shitake mushrooms, sweet corn and carrot. For flavor, Mamee collobration with renowned celebrity chef , Dato Chef Ismail to create outstanding flavor such as Spicy Chicken Shitake, Creamy Tom Yam and my all time favorite Laksa Curry from fresh ingredients of herbs and spices! I am one person who are very fussy when it come to instant noodles. I love Curry and Tom Yam flavor the most. I would never eat instant noodle with just their flavored soup without adding my own recipe to make it more ‘kick taste’! I would add in chilli paste,curry powder,lemon juice to make it more tangy taste and then add in tofu,some veggies to make it more feel like a complete meal. Try Mamee Chef, you will give this thumb ups! I tried Mamee Chef for the first time and seriously, you don’t have to add all those ingredients I mentioned. You can just cook and eat it as it is. The taste are to remember and make you want another bowls. 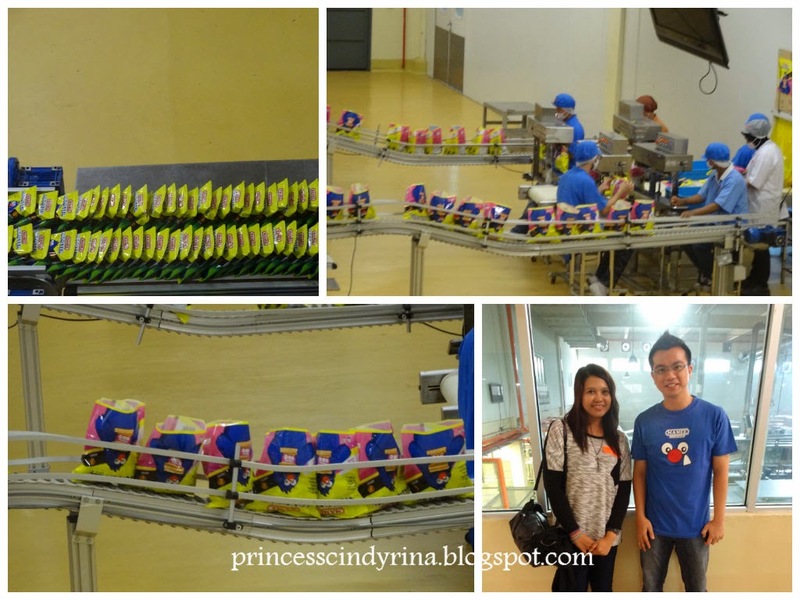 Enough with the long history…let us continue my fun trip story visit to Mamee Factory at Ayer Keroh , Malacca. While listening to outstanding presentation from the Marketing Manager of Mamee, Ms Soong Sham Mee , we were served with refreshing and delicious Yogurt drink. TADA!!!! The Sifu from China,demonstrated the La Mian aka Mi Tarik. How the La Mian were made??? They use the push and pull technique. Don’t try this at home if you are not the expert. IMA! Don’t guarantee you be able to eat your noodles in time.Why the hassle when you can just buy Mamee Chef and eat your La Mian in just 3 minutes. So convenient! Forgot to tell, Yg BerBhg Datuk Pang Chin Hin aka Mr Chairman and The Founder, made his presence during our visit. So cool! Did you see the Gentleman in White Shirt standing Second right. 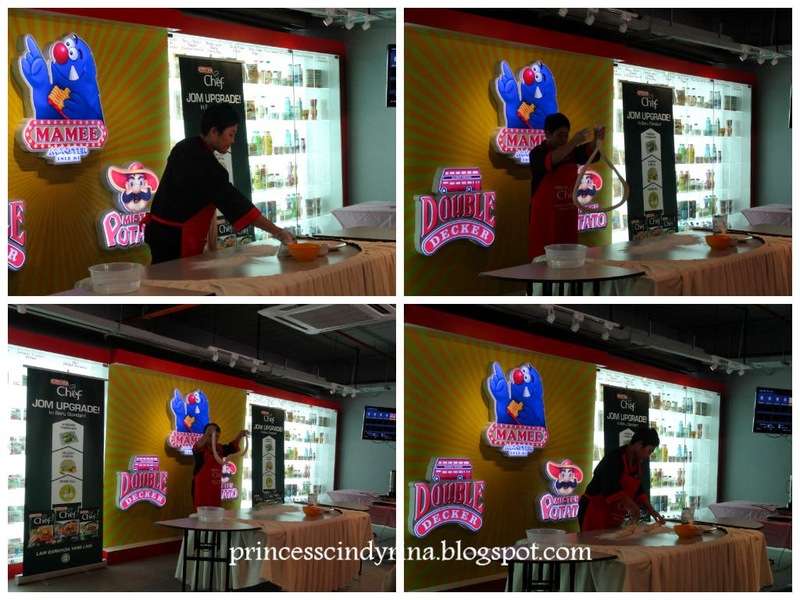 Then we were presented with this Curry Laksa paste cooking demo. That Amoy…ar!!!! Seriously want to kidnap her out. She cook that gravy until so ‘heong ’. Blend all the ingredients and stir fried it until it fragrance and add in the tamarind juice….then blend it. After blend slowly add in paprika juice. 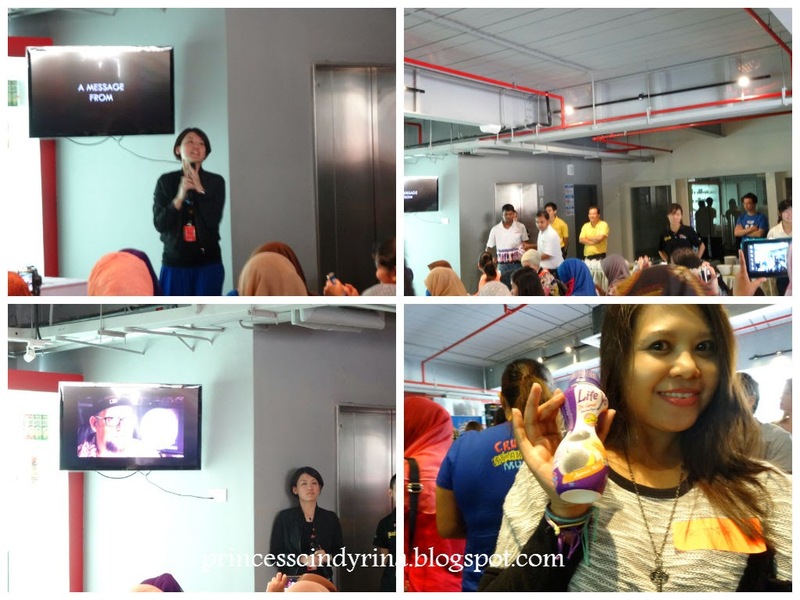 IMA does not guarantee this Curry Laksa paste recepi….hehehehe it just my theory from what I was presented that day. I never try to cook the gravy myself. Kekekeke…don’t scold me ar…if you follow this recipe and your curry laksa paste turn out disappointment. 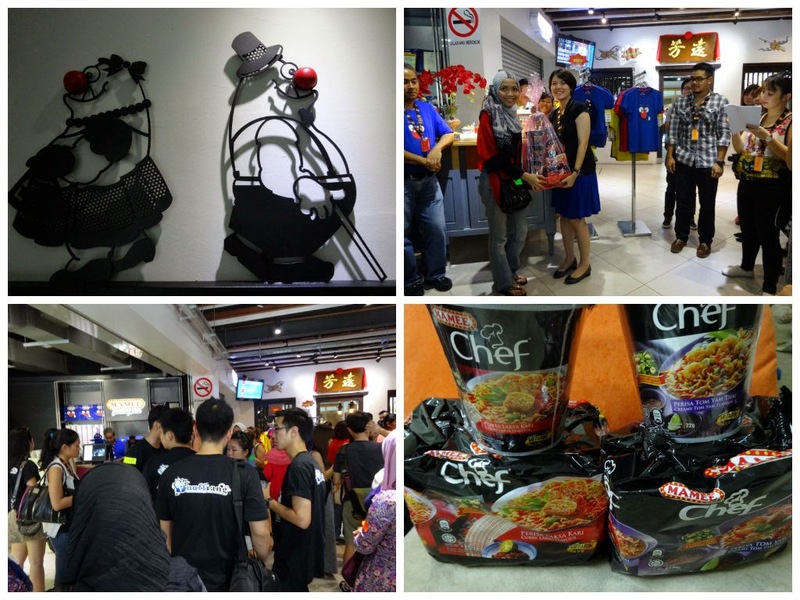 After the cooking demo, we are divided into 2 groups to visit the mamee chef factory plant. The moment of truth! The one I am waiting for….yeahhhhh!!! I continue waiting….because I am in the last group. 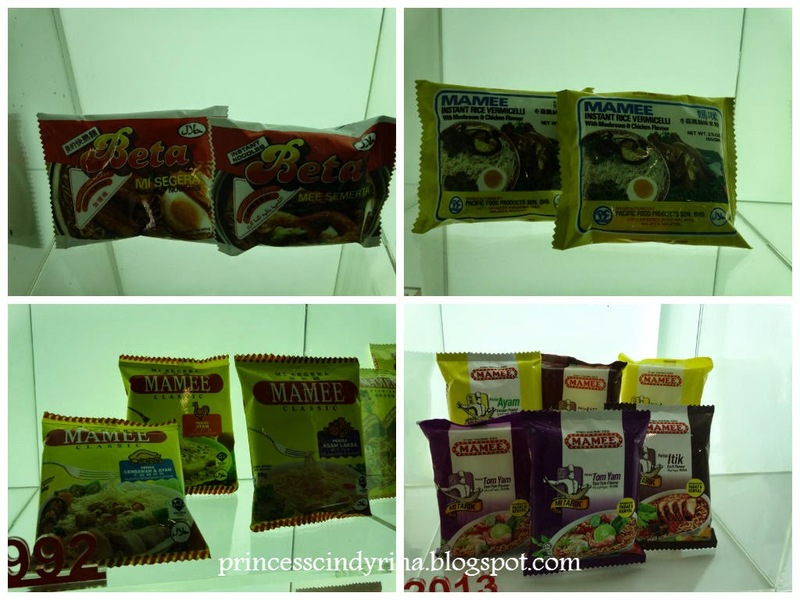 While waiting, I took my time browsing through the history of Mamee product since day one they started the brand. Gosh!!!! Still remember that ad when I was little girl…’Mamee!! 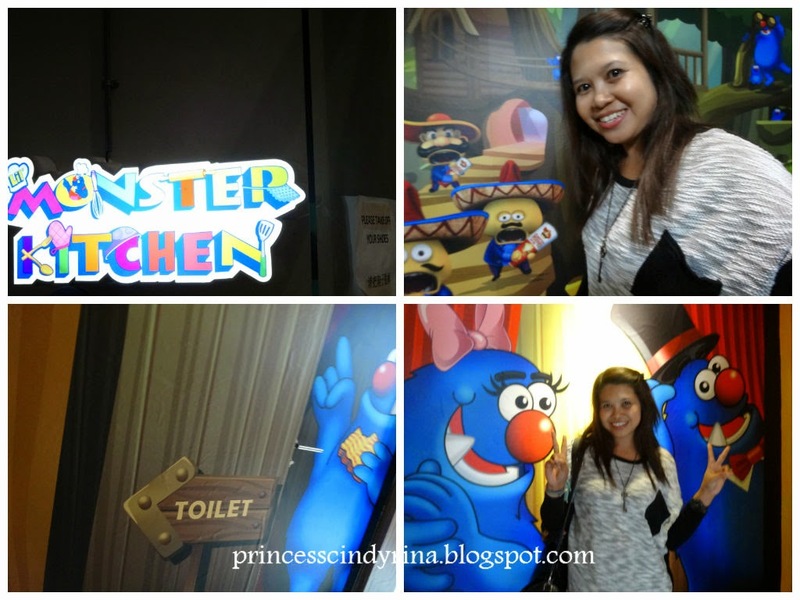 Many bloggers took this waiting time to do their most creative pose at Mamee Fun Squad booth. IMA! Feel so out of place and not use to this environment. 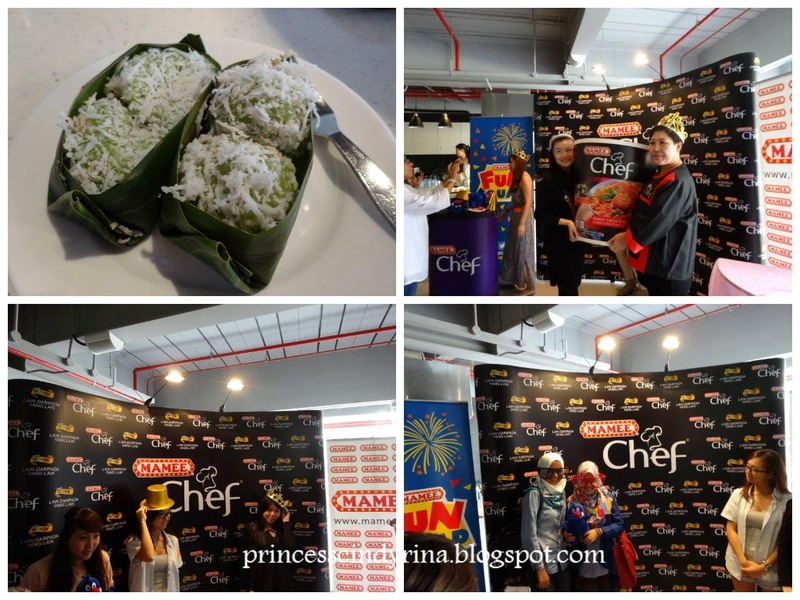 Busy munching my delicious ‘Onde-Onde’ and smile away to these wacky and crazy bloggers act. Yeayyyyy!!! My turn to go in!!!!!! See? That cylo on top left? That’s where the flour drop to the dough mixture machine. Why the texture of Mamee instant noodles are so different from others? They added in palm oil. That worker called ‘piano man’ because their action is like playing the piano. 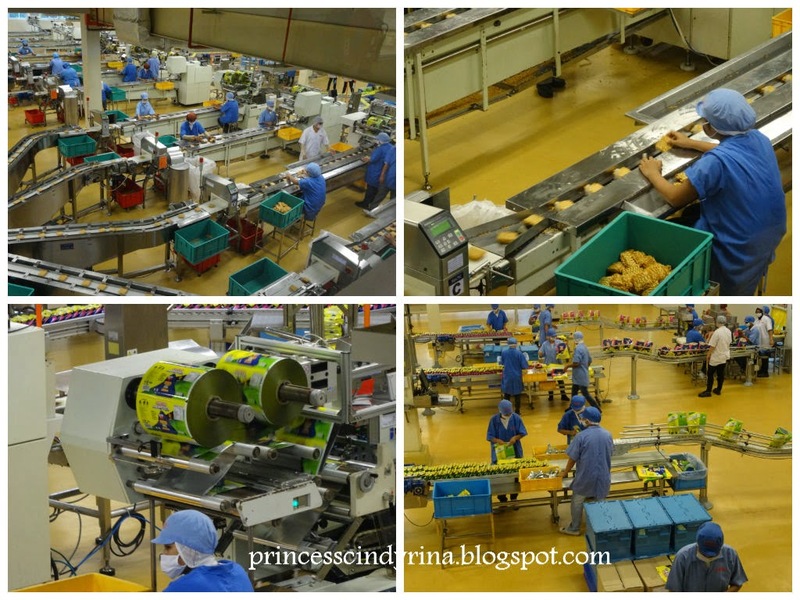 Their job is to make sure the noodles are solid down to the mold before it goes into the deep frying process. 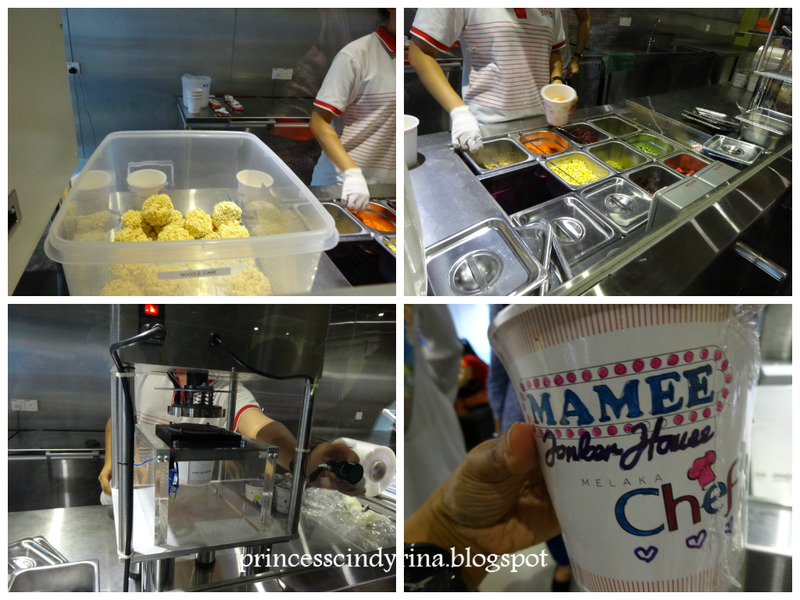 There you go…the noodle cup ready fresh from fryer! The plant on the opposite side is producing the famous Mamee Snack! The process is almost the same like instant noodle, it just that Mamee Snack noodles need to go through the bathing process. The bathing process will be either Chicken broth or Barbeque Flavour broth. Now you know why our snack taste so good!!!!!! My favourite Barbeque mamee flavour ready for me to eat!!!! Yeah!! See that man in Mamee Monster blue shirt posing with me? He is Danish Tan, Production Planning Manager at Mamee Factory,Ayer Keroh Malacca. He walked us through the Mamee Chef production process. Yes! We went through the detailed like the Safety and precaution take by Mamee to ensure all their products are safe to consume by consumer. According to him Mamee production process , 7 lines and able to produce at least 100,000 Mamee product in a day. Thank you Danish Tan for detailed explaination to us. For lunch, we were served with Hainan Chicken Rice ball, Chicken Sate and delicious cakes for dessert. Since I don’t fancy Chicken meat…there you see me with that two chicken rice ball with tangy ginger and fresh garlic Chilli Sauce.Serious! yummy….wanna taste this delicious Chicken rice ball??? Let us pay a visit to Mamee Jonker House, No. 45 and 48,Jalan Hang Jebat , 75200 Malacca. While waiting for Mamee Fun Squad come over to lead us to Mamee Jonker House, there is this Dragon Boat race at Malacca Straits. Interesting huh? Huhuhu….you can’t miss this Mamee Jonker house in painted in yellow colour like school bus, smack in the middle of busy jonker walk. We were greeted by Lil Mamee Monster and Mr Steven with his Mamee Fun Squad team That Lil Mamee Monster! so adorable especially its sticking out white tooth. On my right is Mr Steven the Manager in charge at Mamee Jonker house and next to him is Faiz the fun guy from the Mamee Fun Squad. Mamee Jonker House not just a normal store selling Mamee product. 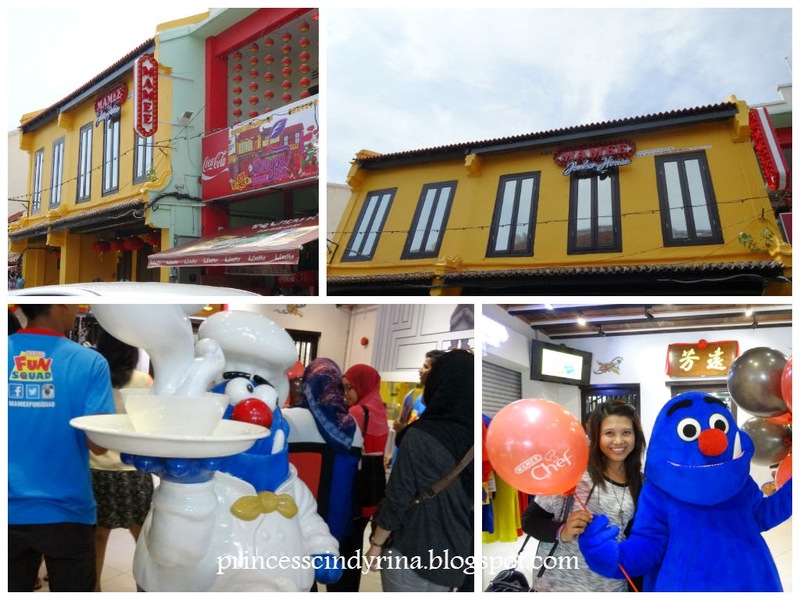 This place is full of fun too.you don’t want to miss out this place if you visit to Malacca. There are 5 sections in Mamee Jonker House. - Merchandise Jonker House where you can shop for Mamee Product and merchandise. - Mamee Café which according to Mr Steven, their famous specialty is Mamak Mee Goreng (there are many repeated customer come for this) , Hainanese Chicken Rice Balls a top secret recipe by Grandma ‘Mamee’ Pang, Creamy Tom Yum, Mamee Pasta. 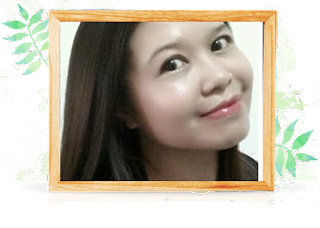 - Mamee world- where you can go back to relive your childhood memories.You can have fun taking photowith Amazing Mamee World and this is free. 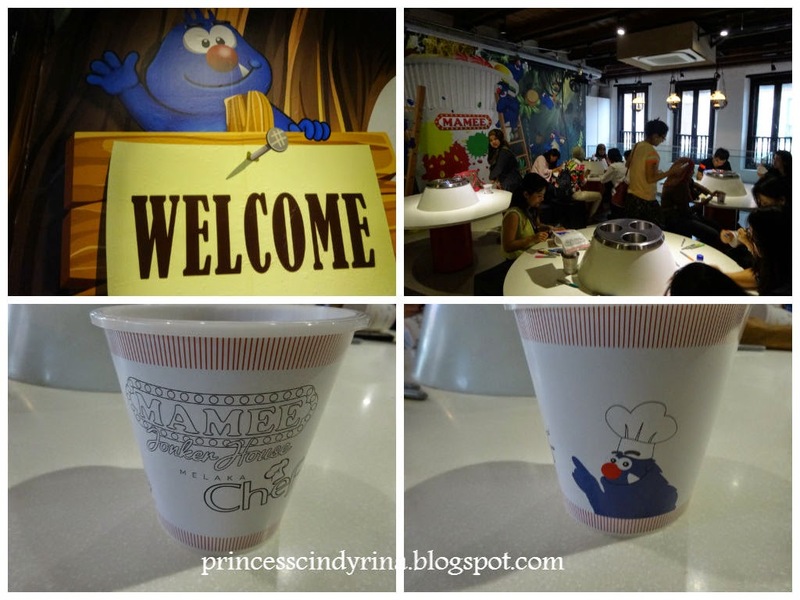 - Noodle Doodle – you can doodle away with creativity your own personalised Mamee Chef Cup. Then mix abnd match your favourite seasoning and condiments. Don’t miss this because this will be your great souvenier to remember your trip to Malacca. 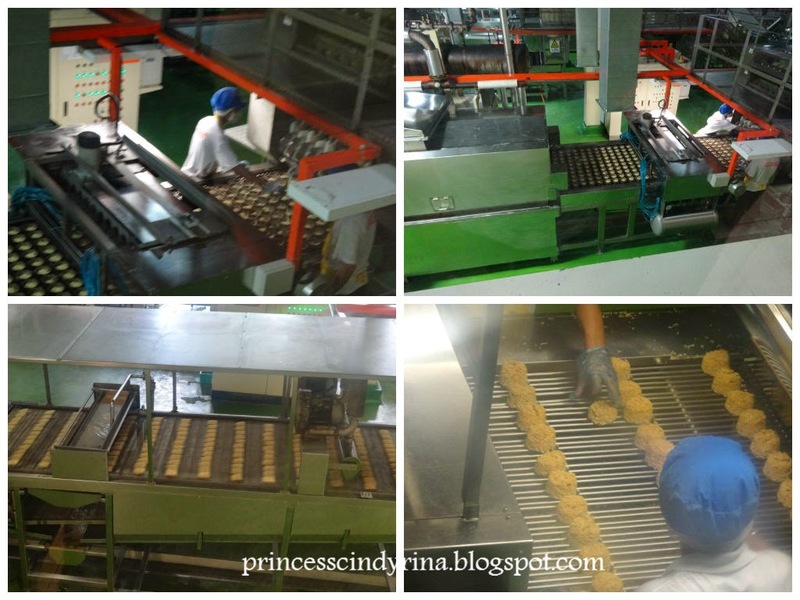 - Lil monster Kitchen – you want to know how Mamee Monster Snacks are made? Take this opportunity and make sure you call before hand to particpate in Mamee Monster Snacks kitchen which be held on Saturday at 11:00am, 1:30pm and 3:00pm. Call +6 06 286 7666 for booking. 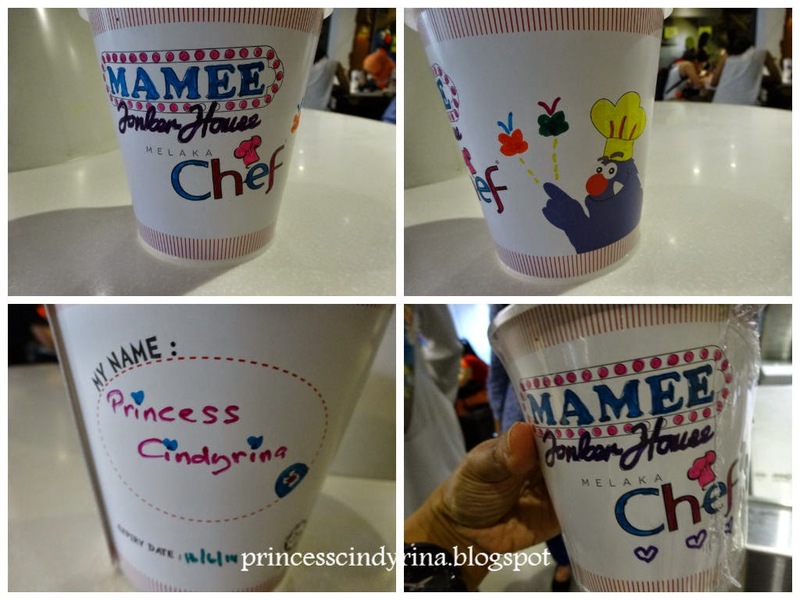 Mamee gave me to Doodle away my Mamee Chef Cup noodle. Tada!!!!!!! 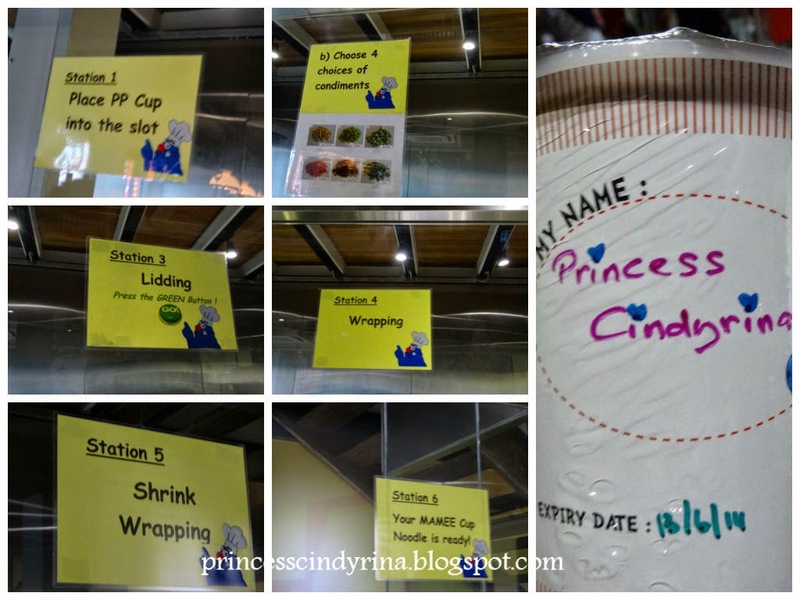 Present to you limited edition and first in the world Princess Cindyrina Mamee Cup Noodles.kekekeke…so simple and basic scribble by me under pressure due to time constraint. I just pass by the Monster Kitchen…maybe next time I will book myself to make my own Mamee Snack. Then , I quickly snap photos at Mamee World. 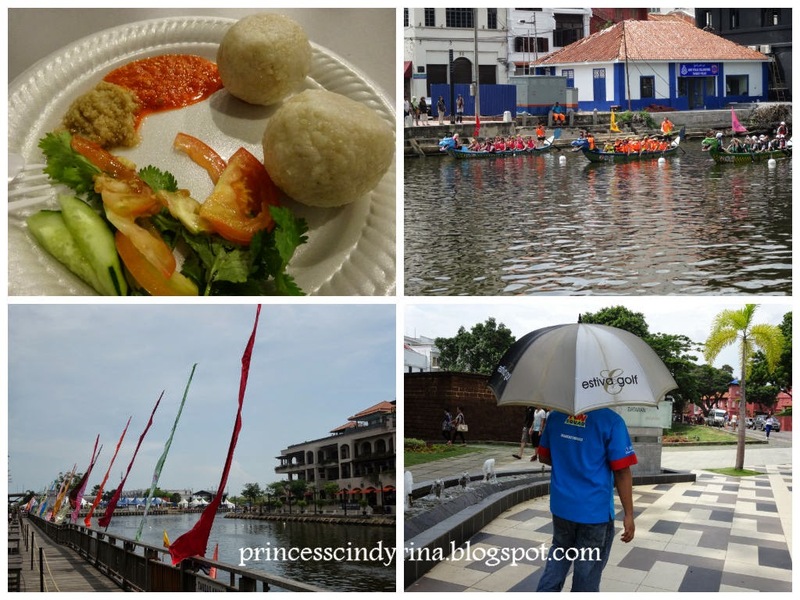 Serious, so amazing and this is a place you don’t want to give a miss when visit to Malacca. Before heading back to subang and knowing that we are not going to stop anywhere to relieve ourself….kekekeke even Mamee’s toilet also I want to recommend you to visit if you come to Malacca. See that top left pair of Lil monsters???? So adorable isnt it? That is where the Ladies and Gents at Mamee Jonker house. Hahahaha every corner of Mamee Jonker House you can’t give it a miss ok???? Gosh! If you want to go to toilet you need to pass through Mamee Café. Many people were having their meal there. WTH! IMA! Really wants to try those food. Definitely, wanna ask Chinggu to bring me here so I can try their famous Mamak Mee Goreng and Curry Laksa. While waiting for our Bus, they are having that #Mameechefday most creative photo winner hampers presentation.. Haishhhhh!!! Don’t expect much from me le…IMA is beyond that kind of creativity! Reached Subang around 7:30pm,straight jump into my car and heading home. Back home …so damn hungry!!! Open my goodies bag Mamee Chef Curry Laksa and dig in myself with bowl of it. 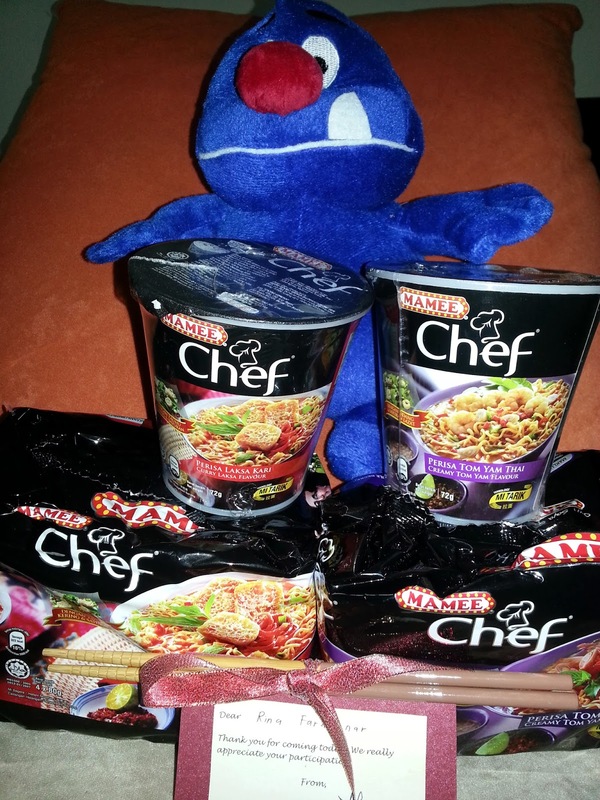 Not that I falling in love with Chef Ismail…hehehehe…me in love with Mamme Chef Curry Laksa. I totally have fun and Thank you nuffnang for inviting me and thank you Mamee for open up your factory door to us! 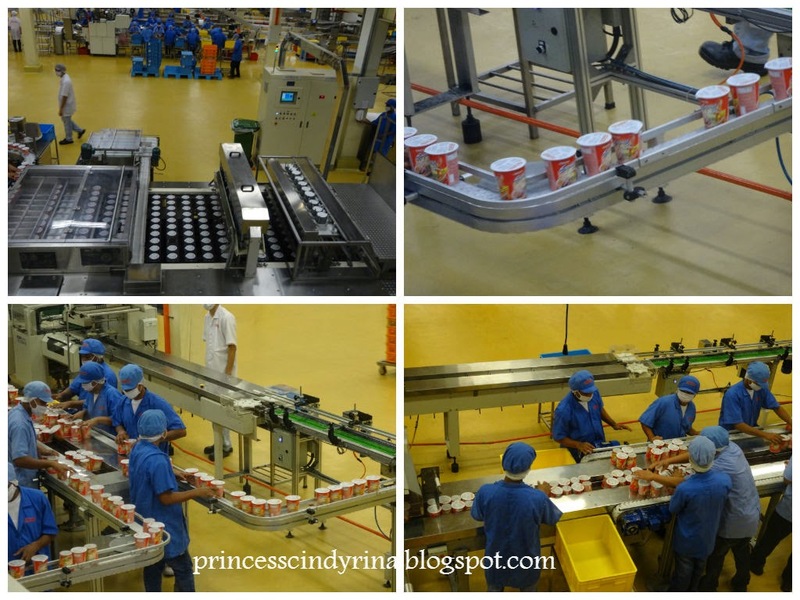 At least we bloggers, who represent the consumer has some inside information on how our favourite noodles being produced! aloooo...if not..we can meet there!!! overall it was a good experience for me! So nice, I never got the invitation.